Ran across this on the interwebs, pretty interesting testing of durability of Mercury 6 cylinder outboards. Would be fun to see an engineering test of C Dory! This is classic 1957 style of film making documentary. Interesting test of Bermuda shorts. Interesting film---wondering how the kept the constant running with outboard's plug and point changes? At that time In my life during the summer of 1957, I was waterskiing behind a Sanger with a 550 HP supercharged engine capable of 75 mph (just hang on speed). The next summer I was in Med school, and splurged $300 on a 13 foot Wolverine (with some dry rot, I had to fix, a homemade trailer--with a 25 hp Johnson outboard)--also slalom skiing--but had to go up on two skis and drop one. In the 70's I was the physician or a number of offshore racing boat owners, and rode in some going over 100 mph. Fast Forward to the year 2000, I had the opportunity to ride with Bill Seebold in a specialized Formula one boat which would carry a passenger. The racing Formula one boats are tunnel hulls 20' long & weight about 880# including the V6 2.5 Liter Mercury, making over 400 HP at over 10,000 RPM. They can go from 0 to 60mph in 2 seconds, and 0 to 100 mph in 5 seconds. (Racing configuration boat) top speeds in the 155 mph range. We hit 138 mph, and over 3 G in the turns--Not something I would want to do for a living! Today there are many specialized rules for sanctioned boat races: Boat drivers and crew wear a special life jacket with neck support. have an O2 pony bottle, are in a kevlar and carbon fiber capsule, a five point harness. There are multiple rescue boats and divers around the course. None of that seemed to exist on Lake x. Impressive, even if considerably cavalier about some aspects of safety (PFD's). Interesting that they had to replace the boats half way through at 25,000 miles. They appeared to be of plywood and wood frame construction with lots of glue and screws. Probably fiber glassed over on the outer hull. 25,000 mi at 30 mph (average, stated) = 833hrs, and 50kmi =1667 hrs, not inconsistent with what recreational boaters get today, although in daily use commercial OB's often log 5,000 hrs or more. Sitting still and corrosion are still the major enemies of OB's. Back then, gas was gas (no alcohol), and 24 to 1 gas to oil mix was the standard, which is pretty well lubed up. Later 2-stroke OB's were rated at 50:1, then 100:1, and beyond (E-Tec). Advances in oil formulation made this possible along with some engineering advances in motor design. Joe, I agree with most of your assessment. However, I don't believe that those boats had an overlay of fiberglass in 1957. Mercury had bought 4 Raveau Boats. for the tests. The first two were 15 feet, and the second two were 16 feet. The reason given for the change of boats was that there was more wind and wave action during the second 25,000 miles of the test. I suspect that the boats had a number of dings--but there was no comment about repairs (my suspicion is that some repairs were made.) 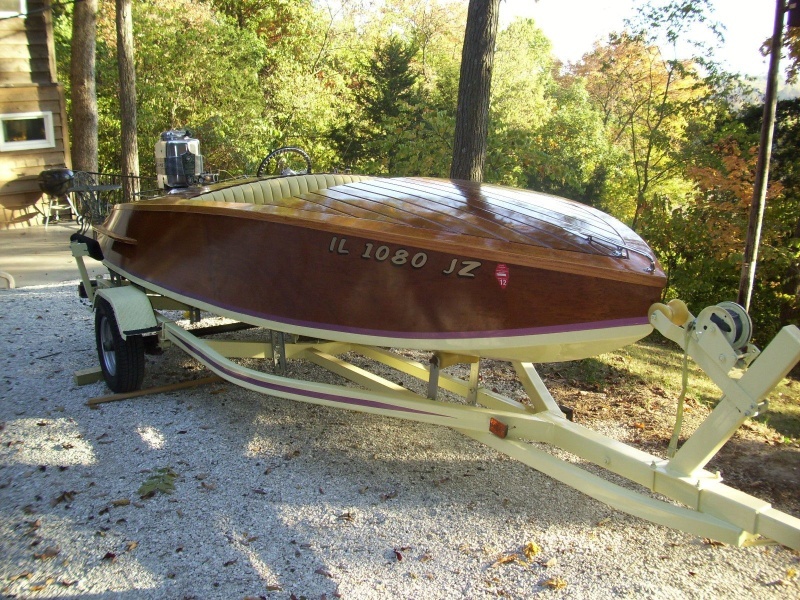 However, having owned a ZinCraft--a slightly larger 16 foot boat (higher freeboard) of that same vintage and construction, none of the boats had fiberglass overlay. My experience with glass over plywood in that period of time, was that adherence was fairly poor--and a very good chance that the fiberglass would have delaminated from the plywood hull bottoms considering the conditions on Lake X. ....and though there was mention of changing points and plugs at some interval, there was no mention of when or how. Seems rather a difficult task at ~30mph on the water without shutting down the OB. No damage to the boat or motor noted after the 'gator strike. Wonder if those motors had kick up ability back then? I know Duncan--and suspect that he has done some considerable research on the subject before he would make that statement. I suspect that the boat was pulled out after the strike and examined. They must have changed points and plugs with engines shut down--no other way--and those boats did need plug changes. No mention of water pump impellers -but those also needed more frequent changes. Yes, the motors kicked up back then. I had a similar boat way back when, a General Marine Speedliner, from 1957-1960, (high school years). Made it into a nice ski boat. Fiberglassed the bottom and sides myself and added a larger motor. 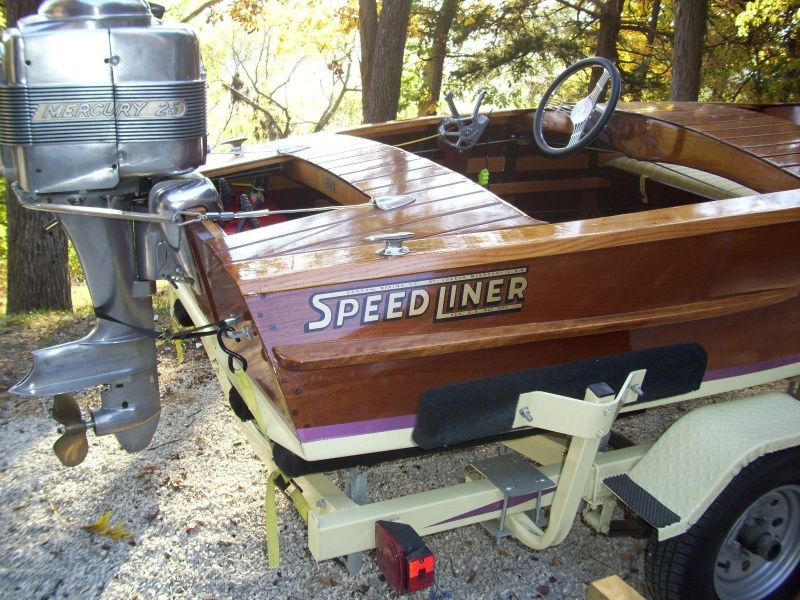 Had been built in St. Joseph, MO, as a racing speedboat of mahogany, oak, and plywood along with a ton of screws and glue. Nice designed shape. Painted it lavender and white and added upholstered seats and interior. Fun for a teenager, or anyone, for that matter. The one below has been restored, and the rear deck added and interior modified. I remember those direct reversing Merc motors! No neutral: Ran in forward normally. For Neutral, it shuts off. For Reverse, the motor starts and ran backward! Hard to maneuver, and dangerous too! To easy to get too much rpm and abrupt movement. Probably hard on batteries. Direct reverse was abandoned in favor of a full shifting lower unit. I never owned one, but my brother-in-law's dad (am engineer) did, and he hated it. I learned some new language (#*%@!+!*?) from his expressions of love to that 75 hp wonder! Ha! That Speed Liner looks like it has a racing prop on it. Only 20 hp (The mark 25 ws 20 hp,--but that was the largest engine at one point. I am assuming that this engine pictured was a mid 1950's engine.) The aft steering was just like the Wolverine I had, difference was that the Wolverine was cold molded, so it didn't have as hard a chine. The Speed Liner would have been faster--and Mercs were definitely faster engines back then. I have to laugh at the steering--they were all some variation of that--cable over a drum, with pulleys to run the cable thru--and every once in a while the cable would break or a cable clamp would slip---woops a real high speed turn. Also the Speed Liner and the boats that were run on Lake X had the Richardson Dead Man Throttle. I suspect that this Speed Liner's "25" didn't have a shift. The larger Mercs (60 hp Mark 75 and 70 hp Mark 78, didn't have shifters (direct reverse) because there was no lower unit robust enough to handle the hp at that time. A little history digging, reveals that not all diver changes were boat to boat--in fact that may have been a stunt for the film. The standard driver change the boat was brought to the dock--they would not have risked that boat to boat driver change at night! Also the engines were stopped for "routine maintenance"...so there appears to be a bit of "Hype"--or as called today "false news"....in the video advertisement. Incidental trivia--Mercury built chain saws during WWII--their chain saw would cut a 24" green log over 3x faster than the competition! So Bob... I gotta know... Have you ever said hold my beer n watch this yall? My southern friends have warned me many times, "If you ever hear someone down here say "watch this," you might want to step back a pace or two." The warning is to be taken particularly to heart if the situation involves beers, boats, or barbecues.